It was blistering cold, but that did not stop a group of very motivated New Rochelle Middle school students from pitching in at New Rochelle’s Five Island Park. As part of the Junior Honor Society service hour requirements these upstanding kids donned gloves and started picking up trash. A real treasure trove, one might add. Tires, a tricycle, endless bottles and Styrofoam cups were bagged. Sonia Morris and Stella Giordano, both 8th graders, decided to do it the hard way and chose the breakers as their spot to clean up. Climbing the boulders and reaching into crevices to dislodge the bottle was great fun and one nearly forgot about the ears that froze off in the wind chill. It was a humbling experience to see just the amount of garbage within the rocks, and the yards and yards of discarded fishing line, entangled around things. 2 hrs later, 4 filled bags of trash and a donut in one hand, both recalled that it was hard work but also very rewarding, and they both felt good about giving up their weekend morning to make a difference. Students from Ms Starcevic’s class just learned about the perils of littering and they are not holding back about what they learned and how they feel about it. We Future Cycle just finished up teaching a program to all of Jefferson’s Kindergarten, first and second grade students on what happens to organic and inorganic materials in our world. The kids did a hands on (and rather messy…..and they LOVED that part) experiment to find out how water interacts with different materials. Afterwards they were invited to write about what they learned and if they were interested in more information. James learned that if you throw soft plastic then the fish will die, the turtles will die because they will eat the plastic and it clogs up their stomach. Jaquan learned that the rain will bring the litter on the streets into the sewer system and that brings it to the sea and the fish can eat it. Emalia did a great job retelling that she learned about how seeds grow and how to clean our Earth. Tyanna took the time to recount the science experiment we did in class. Monserrat shared that he learned all about seeds and how different they are and how surprised he was that they contained food. He also learned how important it is to clean the Earth. Mia summarized very neatly that organic things smush (sic) in water and inorganic things look the same. She also said that in her house, bringing out the recycling is her job. Every single student wrote that they want to learn more about how to make a difference in this world. They were attentive and all pledged to be good models, to never litter and to help clean up this world. Thank you ! Ms Starcevic’s class for sending me all these wonderful letters. Last night about 300 of New Rochelle’s parents had a chance to stroll in the festively decorated lunchroom of Albert Leonard Middle School to view lots of silent auction item as well as tasting delicious fare from fabulous New Rochelle restaurants. The annual ALMS PTSA fundraiser “Taste of New Rochelle” was a relaxing place to meet and greet parents we only get to see on our (hurried) way to drop off or pick up our kids. Last night marked also the first time that this event was source separated to mirror what the students are doing in the lunchroom. Parents had the opportunity to sort their waste into “Food & Paper” and “Commingled Recycling” and they all did it with gusto and flawlessly. Anna Giordano, Executive Director of We Future Cycle, the not-for-profit organisation that was hired to bring extensive sustainability programs to the district was there to help at the station and to share the fabulous results achieved in all the schools since the inception of the program. ALMS has reduced its lunchroom waste by a whopping 95%, its building waste by a good 50% and its kitchen waste by 65%. All in all, that is about 450 lbs of garbage NOT generated every day, and that just from one of the 9 participating New Rochelle schools. Thanks to the program, New Rochelle School District was able to revamp its waste management system and save considerable funds. Carl Thurnau, the Director of Facilities for the district has just quantified it at the ongoing budget meetings with an annual savings of $130,000. And of course, Westchester County is benefiting from the increase of recyclables delivered to the Material Recovery Facility near Stew Leonards. Recyclables are commodities that are sold back to industry for considerable prices. ALMS Taste of New Rochelle generated 3 large bags of recyclables, one bag of food waste for composting, and only about 2 lbs of trash, mainly Styrofoam products. 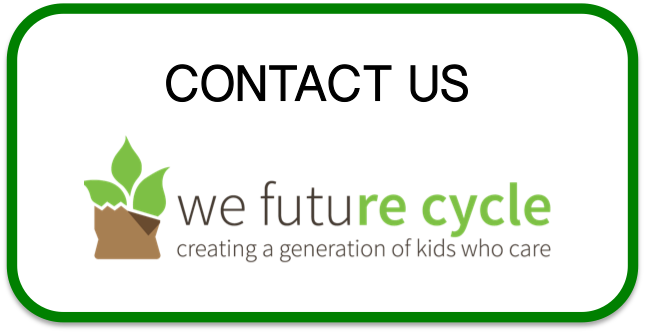 New Rochelle Isaac Young MS has started the We Future Cycle recycling program in the lunchroom last year and is proudly looking upon a 97% reduction in waste. At the same time, all classrooms were set up with three bins and students are doing an amazing job sorting. 3 times per week students from the recycling club are meeting to help make sure the sorted material stays separated. They walk the hallways with large toters and are emptying the classroom bins. Helping the Earth is something that brought them together and they are feeling good about doing their part. Monday is the club day where students are learning from We Future Cycle’s Executive Director about the life cycle of materials, the effect of garbage in our environment and fabulous new inventions that help our Earth. Part of this clubs mission is to bring more education through posters and write ups to a larger student population. These students are truly inspirational. That is something that Saboor Tahir learned in a very pleasant way. Today, Trinity’s Assistant Principal presented the gleaming 5th grader with his certificate and an envelope holding a nice cash prize, all in front of his applauding classmates. This 5th grade class was part of the recent “The Science of Composting” workshop given by We Future Cycle. Students touched, felt and smelt compost and learned about what goes on inside the compost pile. Connecting global warming, healthy soils and a solution to a waste management problem was the objective of this workshop and students were tasked to write about what they learned. Saboor Tahir rose up to the task and handed in an essay that very clearly reflected his understanding of the topic and that he did additional research to connect these important dots. Way to go Saboor! Congratulations. Meet Charlotte, a 4th grader at Ward Elementary School that spends many of her lunch periods helping in the lunchroom with the recycling program. She spent the past cold and blustering weekend to create a visual display sharing valuable ideas on how every body can make a difference by just altering their habits a little bit. If all of us did this, we would make a huge difference. Thank you Charlotte!